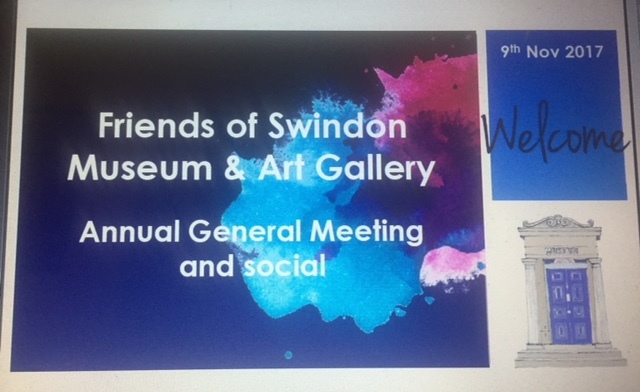 We had a very well attended, successful AGM last night at Swindon Dance, the business was conducted quite quickly, and I'll summarise changes - two of our committee moved on to other things this year. We were sorry to lose John Walsh who had been on the committee for many years, and compiled and edited the Journal until a couple of years ago. The Journal was taken over by Vice Chair Ray Ward, and has now been taken over by Ian Wilkins who will produce the Christmas Journal. On becoming a Councillor, and then also a Parish Councillor, it was fairly obvious that Jane Milner-Barry would have to leave the committee, Jane was a wonderful secretary of the Friends, she is replaced by Rosemary Savage who is a wonderful replacement for Jane. Rosemary and Martin also run the bar at talks which is fabulous. We have two new members on the committee: Rachel Voyce who is going to be helping us with fundraising, and Simon Gale, our new membership secretary. From the voting, we moved fairly swiftly onto Power Point presentations summing up the year's activities. I sent Mike Bradley photographs and he converted them into stories about what we'd been doing. For better photos, or more information about the events, please look back at blog posts. We also were involved with the trip to Rabley to help spread the word about the new museum and art gallery to Rabley Friends.